With the rich milk, butter, and cheese serving as integral parts of any sweet potato casserole, it may seem impossible to make a vegan version that's every bit as decadent and tasty. However, as any creative and determined vegan knows, it's possible to "veganize" nearly every recipe, even those based in animal-derived ingredients, such as quiche and burgers. 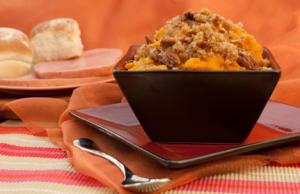 Sweet potato casserole is no exception! Whether you like to prepare sweet potato casserole for Thanksgiving or just as a special treat at another time during the year, it's important you use top-quality ingredients so flavors shine through as well as possible. 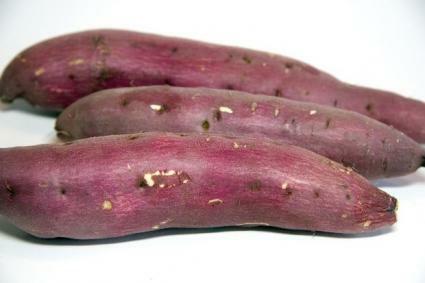 Locally grown sweet potatoes may be freshest and have the richest color. If you use potatoes from the supermarket, make sure they're firm, without any soft spots or "eyes" growing on them. The recipe below is loosely adapted from the Fat-Free Vegan Kitchen site and makes about 10 servings. Before you assemble the casserole, roast or boil the sweet potatoes until they're soft. Let them cool, and peel off the skin. Prepare a 2-quart baking pan by rubbing it lightly with oil or spraying it with a light coating of nonstick cooking spray. Combine the peeled sweet potatoes and the 2 T. vegan butter substitute, mashing them together with a fork or potato masher to the texture you desire. Stir in all of the remaining ingredients until they're evenly distributed in the mixture. Pour the casserole into the pan. In a shallow pan over the stovetop or in a dish in the oven, toast the pecans for several minutes until they're fragrant. Combine all of the topping ingredients and sprinkle the topping evenly over the casserole. Bake the casserole for 45 minutes or until it's bubbly and beginning to brown around the edges. The casserole itself is also somewhat versatile. If you're allergic to nuts or don't want a pecan topping, for example, you can bake vegan marshmallows on top or make the dish more savory by sprinkling on a mixture of bread crumbs, butter substitute, and vegan cheese. The casserole is warm and satisfying no matter how you prepare it, so don't wait until Thanksgiving rolls around to bake this tasty treat.